Based on the phylogenetic analysis, the presence of the “ERFNAQ” motif in the propeptides of both cathepsins as well as the highly conserved genomic organization and chromosomal localization of their genes, we concluded that cathepsins F and W are members of a novel subgroup of cathepsin proteases. According to the current nomenclature of the papain family that includes the cathepsin L-and B-like proteases, we proposed to name this novel third subgroup “cathepsin F-like” proteases. Despite this assignment, both cathepsins F and W seem to be very different regarding their functions. 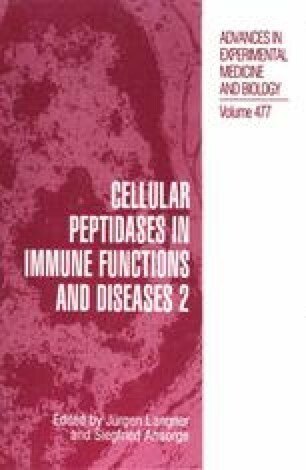 Cathepsin W is exclusively expressed in natural killer cells and presumably in cytotoxic T cells suggesting a very specific function in the immune response. Based on northern analysis, cathepsin F was characterized as ubiquitously expressed protease suggesting a house-keeping function. Interestingly, cathepsin F contains a very long propeptide that encodes a “cystatin-like” domain, which might function as an endogenous cysteine protease inhibitor after its release from the cathepsin F zymogen as proposed by Nagler et al 1999. Future studies will shed light on the regulation and functional implications of human cathepsins F and W.